Located in the state of Florida, Altamonte Springs is a mid-sized city with a population of 42,557 residents. With a population density of 4,674 people per square mile, Altamonte Springs is well above the nation's average density level. If we take a look at the last Census, the vast majority of the population falls within one racial group (77% White). Given that fact, Altamonte Springs could be considered less diverse than other cities. Additionally, more than a quarter of the population of Altamonte Springs are of Hispanic or Latino origin, and 20% of the population also speak Spanish. Are you trying to ascertain if living in Altamonte Springs is the right fit for your lifestyle? To ensure a good experience before relocating to any new city in Florida, you will probably want to make sure that you check all of the most important boxes. With useful information like amenities, crime, weather, education, housing and other key data points, finding the best places to live in Altamonte Springs and in the areas around Altamonte Springs is a much easier task. Altamonte Springs, FL receives 82/100 for its livability score; this results in a ranking of #109 in Florida and #1,122 in the USA. 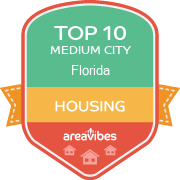 This is a fantastic score, as Altamonte Springs ranks well in multiple categories! Altamonte Springs also ranks in the top 10 percent of all cities, which is no small feat! For each of the livability categories, we can establish that Altamonte Springs ranks very well for amenities (A+), cost of living (B-), weather (A) and housing (A). There is at least one category that does not have great scores in Altamonte Springs. The following was graded with a discouraging score: crime (D). Based on the proximity of local amenities like grocery stores, restaurants, coffee shops, parks, librairies, etc., Altamonte Springs has received a higher than average score for its local amenities. If you’re planning on relocating and making this area your permanent home, it’s nice to know that there is an ample amount of amenities and things to do within walking distance or a short drive. Some of the interesting things to do and attractions include: Crane's Roost Park, Birthday World, and The Links at 434. For buyers, real estate will be the largest purchase they ever make and it will also be their most valuable asset. For renters, the monthly rent paid on their Altamonte Springs apartments will most likely be their largest expense. Based on tangible metrics like home and rental affordability and appreciation rates, housing in this area has received a score that is well above the average of every other US city. Being close to public transportation, grocery stores, parks and other conveniences are all important when weighing your options for a new home in Altamonte Springs. Before you determine if any of these amenities are available in the area, you will also want to know if the real estate prices in Altamonte Springs are affordable. The median home price for Altamonte Springs homes is $136,300, which is 18.3% lower than the Florida average. If we take a closer look at the affordability of homes in Altamonte Springs, we’ll see that the home price to income ratio is 2.7, which is 20.6% lower than the Florida average. Year over year appreciation rates for homes in the Altamonte Springs area were 11.7% and the 5 year appreciation rates came in at 12.7%. Why is this important? Knowing the appreciation rates for any area is a quick and easy way to determine if you will see a solid return on your investment. How Do You Rate The Livability In Altamonte Springs? I love living in Altamonte Springs, Florida. This place has been home to me for more than 40 years. We are so close to the Orlando area that I can visit the major theme parks anytime I want. We are a bit smaller than the Kissimmee area, with close to forty-one thousand people living here. As you can imagine, we deal with the same things that most big, tourist-laden cities do. We have congestion and plenty of tourists milling about, but we do have so much to do. I can never say that I am bored living here. The sky is the limit for the locals. Did I mention the theme parks? Well, I am sure I did, but it is something that you just can't overlook. The fact that you can travel just a few minutes and be at some of the world's best entertainment cannot be ignored. If you love the nightlife, then this place is one happening spot for you. We have more clubs than you could ever visit in a month's time. Then there's the excellent shopping. I frequent the parks around here because they are so beautiful nearly all year round. You simply must visit the Hermits Trail & Turnbull Ave or the Lake Lotus Nature Park. Both are excellent for bird watching or for spending a day out in the sunshine. The fourth of July is my favorite time of year around here. I love the Red, Hot, & Boom celebration that is put on by the city every year. For one stop shopping, you must head over to the Altamonte Mall. There are more than 160 stores inside this venue and some for the budget shopper too. Orlando is about a 30-minute drive, and the beaches are within an hour and a half drive. So to sum up this city, it is one awesome place to live. Source: The Altamonte Springs, FL data and statistics displayed above are derived from the 2016 United States Census Bureau American Community Survey (ACS).